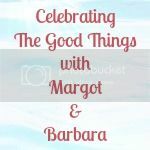 Hello and welcome to week five of The Good Things, my weekly linky celebrating all the things that bring us happiness! A huge thank you to everyone who has joined in so far. It’s only a small linky at the moment, but I am hopeful that it will grow to be a really strong community of optimism. My Good Thing #5. Pastel de nata. Otherwise known as Portuguese tarts. I’ve just returned from Lisbon (more of which in a future post) I’ve been on a very quick visit to Stephen, who is currently journeying south to Morocco and the Atlas Mountains. It was a wonderful trip and so, so amazing to be together. Coming home alone has been a challenge and I’m counting down the days until I see him again. And keeping myself busy by trying to recreate the patisserie wonder that is the pastel de nata, because I am hooked! I finally made it back it to the Good Things after a hectic couple of weeks. I’m so pleased and delighted to see I’m on a sub-theme with you of baking delicious things! Oh, I love these little things! They have some great ones at Teppan260 (not the place you’d think to look!) – although obviously not quite as authentic as ones from Portugal! Ooo yes. I really fancy one of those. Right now. Despite the cake I’ve just scoffed. Oh man I love Portuguese tarts. Luckily there is a cafe round the corner from work where I can sneak off for one when the going gets tough!! I love these custardy little treats – do let us know your recipe!